Pattaya Hill Resort.This 99 sq.m. 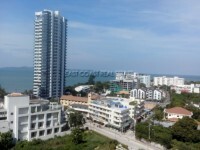 unit is on 8 floor and has 2 bedrooms, 2 bathrooms, light and bright living room and basic kitchen. This unit needs some upgrading but it has stunning views of the ocean, Buddha mountain and overlooking the mountain and ocean. This could make a fantastic unit for an inspired purchaser!! The building itself has a communal swimming pool, car parking, 24 hour security and reception service. The building is also only a short walk away from the famous Cosy Beach area and all the 5 star facilities there. Living area : 99 sqm.